I was just updated the next Clinique, Estee Lauder and Lancome + major GWP page here. (NEW) Deluxe Sample Lip Color in Casablanca with any Tom Ford beauty purchase. (NEW) 6x points for members including beauty. See beauty gift with purchase offers here. Free shipping almost everything or 2-day shipping with incircle membership. Ulta Platinum and Diamond members check your inbox for Ulta 20% off coupon code including prestige beauty! (Upcoming?) Free 11 Pc Electronic Pop Beauty Sampler with any $65 online purchase. 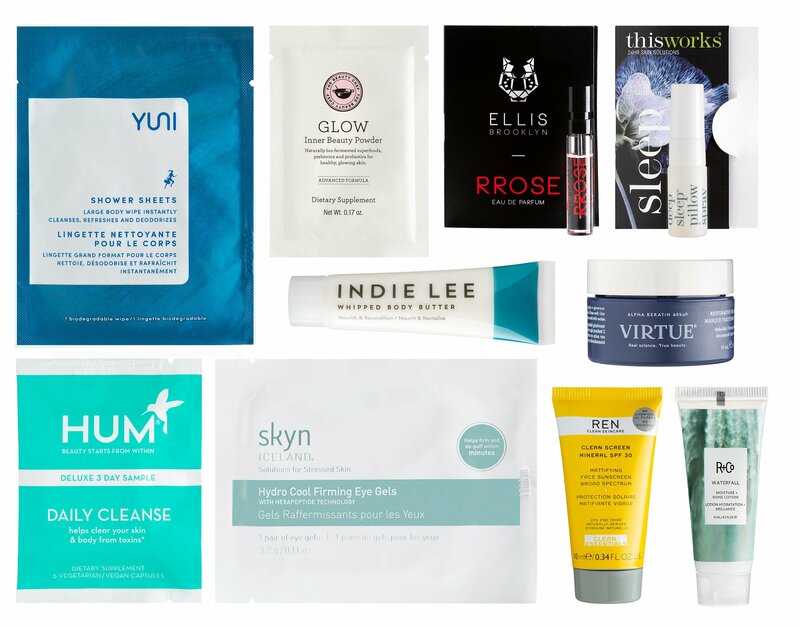 Free 11 Pc Cool Indie Beauty Sampler with any $65 online purchase. Free 11 Pc Nonstop Rock Beauty Sampler with any $65 online purchase. (1d) Spring Haul Event 2019 has begun April 7 – 20, 2019, get up to 50% off all new beauty offers at ulta.com/spring-haul. (1d) Receive $3.50 off $15 purchase use coupon 788213 (exclude prestige brands) any qualifying purchase – printable version coupon here, ends 4/20. Neiman Marcus (NEW)(HOT) Through 4/13, Enjoy $50 off your $200+ regular priced purchase with code INC50! Beauty excluded. Offer valid thru 4/13. See all gift with purchase offers here. Real Natural Beauty & Wellbeing Awards Beauty Box was £80 now 65 – 2 versions. Space NK UK (NEW) Free Full size Algenist Recharging Night Pressed Serum worth 68 GBP with any 80 GBP Algenist purchase. Style Korean (NEW)(HOT) Birthday Sale! BUY 5 Get 1 Free! Free Item will be randomly given and worth more than $35. Wayfair (NEW)(HOT) Through 4/11, Wayfair is hosting their infamous WAY DAY Sale — over 100,000 items will be discounted by as much as 80% off. Plus, for 36 hours, everything ships for free! Antica Farmacista (NEW) Limited Edition Spring Mystery Boxes $100. Simply pick your Scent Profile: Floral, Fresh or Citrus box. Included in each mystery box are three full-size products worth over $200 in retail value — and pssst… each mystery box includes a 500ml diffuser! (3d) FREE GIFT! Spend $50 and get a complimentary 25ml Daphne Flower Room Spray! Enjoy TWO FREE samples with every order. Free shipping on any $75 purchase. Become an Antica Insider and get 10% off your first order! Anastasia Beverly Hills (NEW) 50% off select single eyeshadow. Amazon (NEW) Save Up to 40% – Matcha, Superfood Wellness Teas & Tea Wares. ASOS US (NEW) Further Reductions! Up to 70% off Mid Season Sale, ends 4/18. Beauty Expert US & CA (NEW) The first 200 save 20%, the rest save 15% Use code: SOLUTION *Exclusions Apply – Expires 12th April. 20% off Beauty Expert Collection: The Vegan Collection Use code: TREAT Collectively worth over £180 Expires 4/30. Biossance (NEW) Through April 21st, Receive a Free Travel Size Squalane + Antioxidant Cleansing Oil with any purchase of $35 or more! Use code CLEAN35 at checkout. 20% off with any purchase use coupon code “allure19”. Bloomingdales (NEW) Burberry Buy More, Save More! Take 20% off when you spend $200-499 OR 25% when you spend $500+ on select Burberry Women’s and Men’s clothing at Bloomingdales.com! Plus free shipping for everyone, no minimum! Discount applied in bag. Offer valid 4/5-4/14. The Body Shop (NEW) Get a free mini Satsuma Body Lotion with any $30 purchase use code GIFT4U + free shipping on any purchase. Charlotte Tilbury , Charlotte Tilbury Canada and Charlotte Tilbury UK (NEW) Free deluxe Youth Glow and Wonderglow (7ml each) on any $50 purchase, ends 4/14. Choose a ree rock n’ kohl eyeliner pencil from 3 shades with $50+ purchase. Charlotte Tilbury THE ICON PALETTE EYESHADOW PALETTE $65. 10% Off Your First Order At Charlotte Tilbury! Choose 2 complimentary samples of your choice from 50 samples with every order. Free shipping on any order – no minimum. Clarins (NEW) Free 5-Piece Renewal Routine Gift with any $100+ order. A $88 value! Use code EARTH19. Valid thru 4/22. Cover FX (NEW) Cover FX Spring Friends and Family Event: 25% Off Sitewide + Free Shipping. Plus all orders $75+ will receive a FREE Powder Brush use code SPRING2019 thru April 17th. Crabtree & Evelyn (NEW) offers 50% off with $50 purchase bath & body use coupon code “BA50TH”. David Jones Australia (NEW) Receive your 5-piece deluxe gift when you spend $150 or more on Dior. Debenhams Beauty Discovery Box £35 or £17.50 with any beauty purchase. Elemis US (NEW) Exclusive ELEMIS 10-Piece Gift, Yours For $128 With Your $80 Purchase. Use Code: 10FAVES. FabFitFun (NEW) Use code ALLMINE for $10 off the Spring Box + a Mystery Bundle Valued at $125 from FabFitFun! Farmacy (NEW) Enjoy 20% off sitewide use coupon code “BOXY20”. (NEW) Or get $10 off with $50 purchase use coupon code “FARMFIT10”. Free shipping on any $40 purchase. (NEW) Gift sets on sale here. Forever 21 (NEW) Birthday sale: get a free gift use code F21BDAY with $65 order + 50% – 70% off flash sale today only. It Cosmetics (NEW) offers 20% off with $30 purchase use coupon code “FRIENDS19”. (NEW) Plus, free full-size eyeshadow with $50 purchase use coupon code “FRIENDS19”. *Gift contains promotional sized products. While stocks last. Valid against full size product purchases only. Gift also available at in-store, offer varies in-store. Valid thru 13th April 2019. Kiehl’s (NEW) Use code SKINLOVE to get 13pc gift with $50 purchase. Laura Geller (NEW) Receive $25 off $60 on all orders placed on laurageller.com with code SS25, ends 4/12. Nautica (NEW) Take 50% Off Everything (Some Exclusions Apply), ends 4/23. Neiman Marcus Last Call (NEW) Extra 35% off ENTIRE site. Free shipping on any $99 use code LCSHIP or free with any purchase use code FREESHIP. Free $10 instant coupon when you sign up for their newsletter. Omorovicza (NEW) Celebrate your sibling with a surprise gift from Omorovicza. For a limited time, receive two complimentary travel-sizes when you spend $120 or more Offer code: SIBLING. Choose 3 free samples with any order. Free shipping all UK & US orders no minimum. Origins (NEW) 3-pc free gwp with any $45 order, including a free tote, flowering plantable pencil + Mega-Mushroom Treatment Lotion use coupon code “EARTH”. Philosophy (NEW) Buy 1 Get 1 Free with code “1free”. Exclusions apply. Shipping is free on orders $50+ or shipping is $5.99. Offer ends 3/20 (NEW) Or 40% off use coupon code “comeback”. Prescriptives (NEW) GIFT 1: You will receive a 4pc Mother’s Day gift bag worth $99 with your $65 purchase. GIFT 2: Choose 4 free samples on any $25 purchase. REN (NEW) Free Travel Sized Minis of Glow Tonic & Glow Daily Moisturizer with $85 Order. No Code Necessary. Offer valid through 4/17. Revolution Beauty (NEW) Mystery Bag – The great makeup giveaway is BACK Get £28 of free makeup when you spend £30 or more, ends 4/18. (NEW) Through 4/18, Select a FREE deluxe skincare sample when you spend $30. Saks Fifth Avenue (NEW) Gift card event including beauty! Use the code “APRGC19“at checkout, ends April 11th. Sephora and Sephora.ca (NEW) Receive 2 FREE trial sizes with any $35 purchase. Use code SOSET. (3d) Use code URBANTRIO to get a free 3pc deluxe gift from Urban Decay on any $35 purchase. SkinStore (NEW) try the new Glycolic 10 Renew Overnight Corrective Cream with a FREE sample when you spend $100 on the range. (NEW) Save 20% off your purchase with code: SPRING. Plus, receive a FREE Caudalie Vinosource Moisturizing Sorbet (Worth $39) when you spend $80 or more! Tarte Cosmetics (NEW) 15% off sitewide use coupon code “TARTEALLURE”. Urban Decay (NEW) With any $35 purchase get a free mini 24/7 Perversion Glide-On Eye Pencil use code PERVERSION, ends 4/11. Yesstyle (NEW) Korean Beauty up to 80% off sale event. Missha sale up to 60% off. (NEW) Purchase over $25 from Secret Key and get a Sweet Glam Velvet Tint for free! (NEW) Purchase over $15 from RiRe and get a Lip Powder for free!